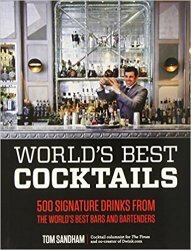 World's Best Cocktails is an exciting global journey, providing the secrets to successful cocktail making, their history and provenance, and where to seek out the world’s best bars and bartenders, from London to Long Island and beyond. Cocktail and liquor connoisseur Tom Sandham provides a comprehensive appraisal of global cocktail culture, highlighting the trends and techniques that make the finest drinks popular in their native climes and across the world. Cocktail lovers will appreciate personal tips from key bartenders such as Jim Meehan and Dale de Groff in New York and Tony Conigliaro and Salvatore Calabrese in London, while cutting-edge recent award winners point to the future with their new daring flavor combinations. At last, discerning drinkers can learn more about what to drink and where, then bring back their coolest cocktail experiences to enjoy at home.